A double garage is not twice the price of a single garage. If you have the room and budget it makes sense to go double. 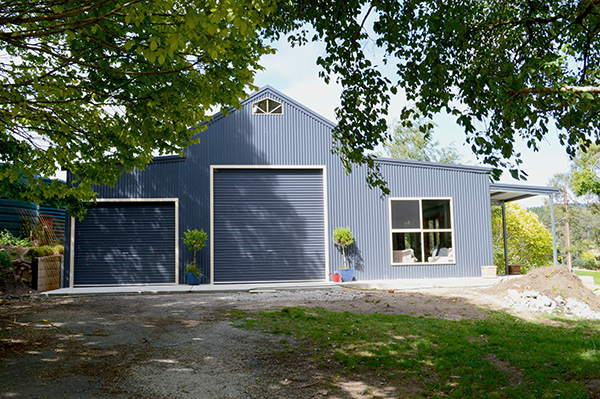 If it’s width you need, an American Barn is a cost effective way to achieve this. The barn style breaks the span of the building up allowing for smaller structural elements to be used, so it’s cheaper. Concrete slabs can be poured either before or after shed erection. If the concrete slab is to be poured after then the wall sheets and columns need to be protected up to the finished floor level. If you require common sizes for garage/shed doors (i.e. not extra large) it will be more cost effective for Allshed Solutions to supply roller doors than sliding doors due to our buying power through the Fair Dinkum Homes and Sheds distributorship. To give your shed, carport or garage a heritage look, use a 22 degree roof pitch and horizontally clad the walls with corrugated profile sheeting. Shed heights under 3m are easier to get a Council approval for in residential areas. In rural areas, cluster shedding together. It is easier to gain approval for than shedding that is spread out. If you are looking to use a shed as a dwelling, we recommend you speak to a building designer to help you with internal layout and working out the structure size you will need.